Happy Child & Mother with Dr. Shyamkishore Lairikyengbam Chairman and Chief Cardiologist, SKY Hospital & Research Centre on the day of discharge. 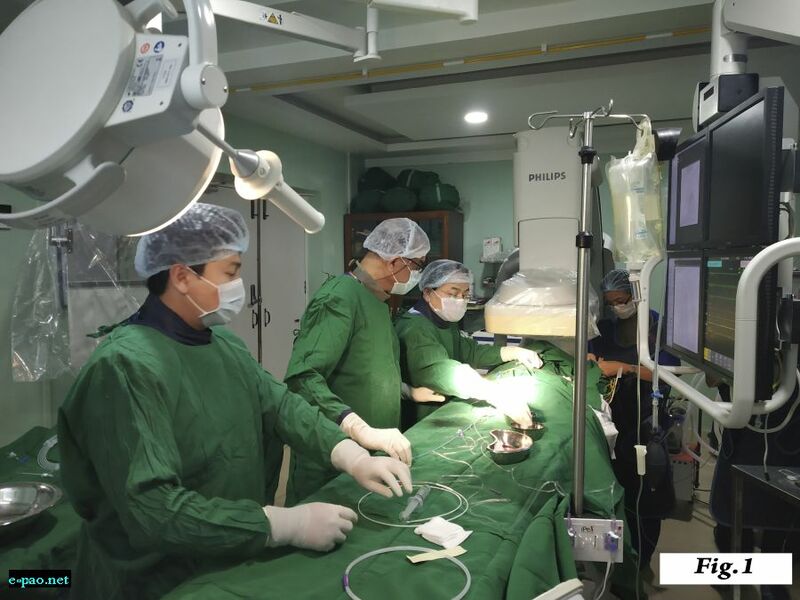 For the first time, SKY Hospital performed Pulmonary Valve Balloon dilatation (PVBD) of severe pulmonary valvular stenosis (obstruction) of the heart of a little baby boy, only 9 months old. 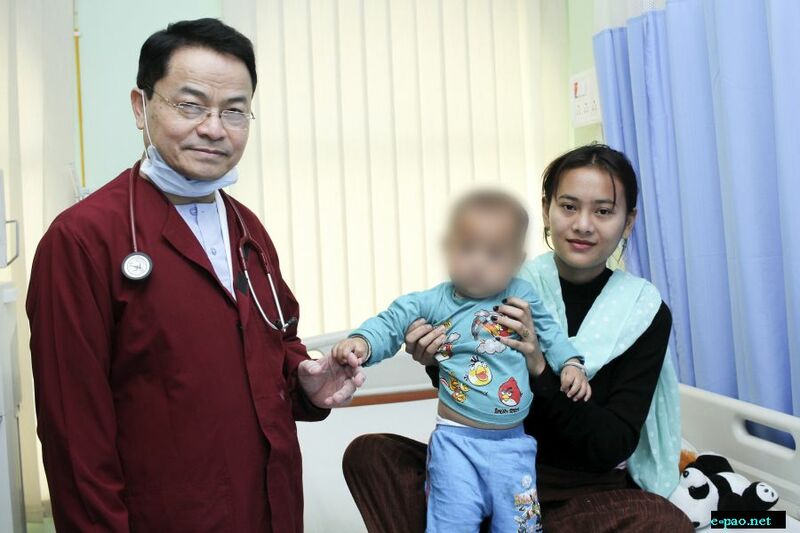 Master Paikhomba (name changed), son of Nongthombam Nikhel of Langjing Achouba, Imphal West suffered from birth heart defect called severe pulmonary valvular stenosis. The pulmonary valve is one of four valves of the heart through which blood circulation inside the heart occurs. Through this valve, deoxygenated (impure) blood is circulated to the lungs for oxygenation (purification). This birth heart defect, if not diagnosed accurately and treated appropriately will lead to right sided heart failure and death. Traditionally, open heart surgery is used to treat such condition. In only selected tertiary heart hospitals, PVBD can be performed for such little baby. The result of PVBD is similar to that of open heart surgery. The procedure commonly called Pulmonary Valve Balloon Dilatation (PVBD) involves introducing the deflated balloon into femoral vein at the level of groin under general anaesthesia. The deflated balloon is then inserted inside the heart via inferior vena cava. 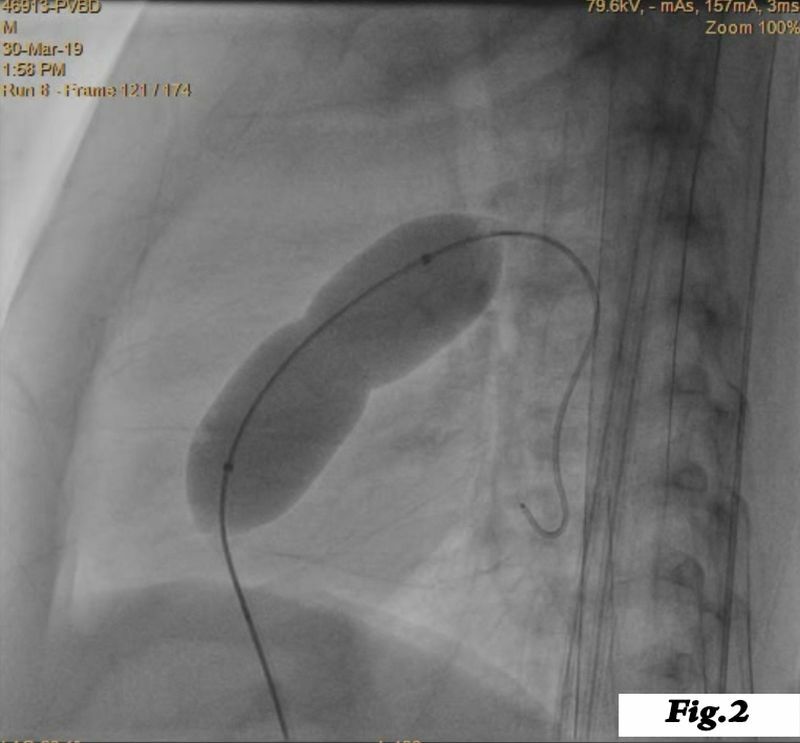 It is then threaded through the narrow (obstructed) pulmonary valve (Fig.1) using Cath Lab machine. The balloon is then carefully inflated precisely, quickly and with precaution. During this balloon inflation blood circulation through the heart stops momentarily (Fig.2). The blood circulation through heart and whole body is restored immediately after deflation of the balloon. The pressure in the right ventricle was dangerously high at 60 mmHg. This came down to 30 mmHg immediately after the successful dilatation of the valve. The procedure took just 1 hour 30 minutes. After 4 hours, the baby woke up, started taking mother milk. He started playing the next day and was discharged home two days after PVBD. Dr. Lairikyengbam Shyamkishore, Chairman & Chief Cardiologist of SKY Hospital expressed his happiness and satisfaction on the success of such highly skilled procedure for such little baby in Manipur. Children with pulmonary stenosis had to go outside Manipur for such balloon treatment until recently. He appealed to the people of Manipur to be aware of such facilities and sophisticated cardiac procedures available at SKY Hospital.